exPress-o: Table Phone Talk: Do or Don't? Cheers to a beautiful long weekend! exPress-o Originals: Hummus 2 Ways! One Couple, One World And Thirty Weddings! Autumn Trend: To Blazer or not to blazer? Eight Awesome Doormats For Autumn! A little end of summer pedicure trick! Table Phone Talk: Do or Don't? Autumn Hair With A Bang! Cheers to a merry weekend! 10 Feel Good Films Of My 20s! Cheers to a brilliant weekend! Breezy NYC City Hall Wedding! 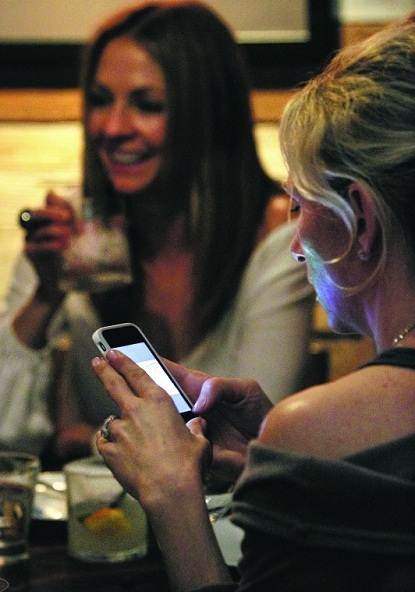 How do you feel about talking on a phone while having dinner with friends or family in a restaurant? 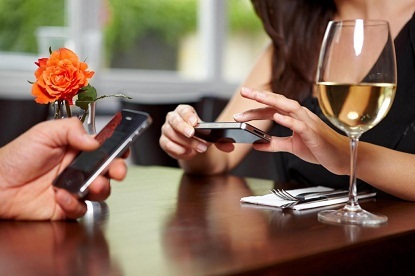 Do you answer your phone or you always keep it silent during meals or coffee dates? This morning, Balazs sent me this intriguing article about a little restaurant in Los Angeles. After realizing that their customers barely talk to each other anymore, the owners started to offer 5% discount for any customer who is willing to leave their phone with the receptionist for the duration of their meal. This way the husband and wife duo hope to help people reconnect again and enjoy a good laugh or meaningful conversation while having a great meal together. 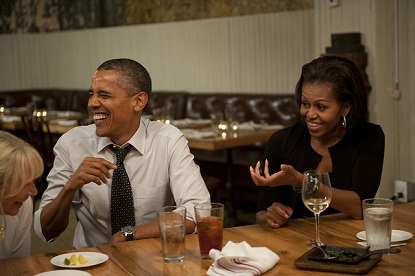 P.S: And this great couple having a good time. love love love this!!! We need to make a shift back to face to face relationships! for me, phone at the table is a definite no! I'm starting to become a lot more cognizant of having my phone at the table, and have started to leave it in the car if I'm out to dinner. It's kind of depressing to look around a restaurant and see people engaged in their phone screens and not one another. i think it is a fantastic idea!!!! personally i have a habit of checking the time on my phone a lot at a meal but i rarely ever text/talk and never check other things like facebook or email. i was at my parents house the other day and noticed my sister on her phone constantly and her toddler instantly wanted to phone as well. my dad stared at the tv so it was basically my mom and i eating a meal together. so sad. Olivia - "We need to make a shift back to face to face relationships" - I love what you said, spot on! Giggle, Jill! I have a friend how always talkes on her phone while having a coffee break with me...it drives me nuts sometimes too. Very true, Amanda and great idea about leaving your phone in the car! I like it. We notice a lot of folks who tabletalk when we're on dates and it's like, hullooooo?! Yes, I have heard of restaurants starting this. So tired of hearing loud talkers discussing not only personal business but life. I remember one time a business man on the phone at dinner and thinking, good thing I am not his competition cus he just gave away all his secrets of the company, silly. I love that idea! I never take calls (unless I know it's urgent) but I do keep my phone nearby to take pictures of everyone at the table - I'm a habitual documenter! I read that same article! I used to get on my pal's nerves bc I'd always scold him for using his iphone excessively around me. I'd say if that he could go hang out with whoever he was talking to as they were more important!!! haha He learned quickly. I think it is true. Technology has allowed us to have infinite more opportunities to communicate.. But what about a good old fashioned conversation?? I hate people who are on the phone when you're at the restaurant... So annoying!!! Ha, Amy! So true. People talk so loudly and they are totally unaware that everyone can hear them. Btw: I love this part: "Technology has allowed us to have infinite more opportunities to communicate.. But what about a good old fashioned conversation??" - You are so right! I think on a date it is a definite no - but sometimes when you are out with other bloggers, some tweeting and instgramming is a must!